Seoul is such an incredible city to explore. 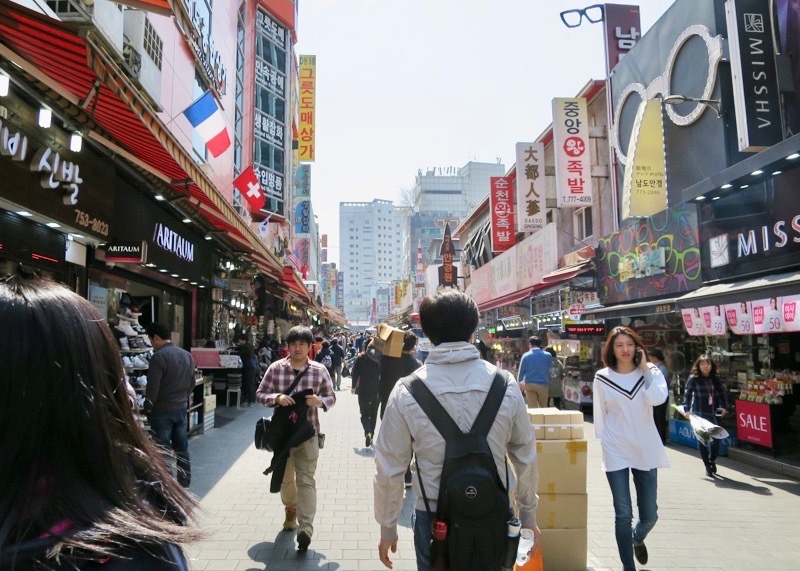 Beautiful neighbourhoods, fun activities, lots of (clean) street food and tons of shopping are just some of the few things you can experience in Seoul. Stylish, modern, and cutting-edge technology combined with rich history makes for a dynamic city that will leave you in awe. Frankly, while my ambitious itinerary left me exhausted by nightfall, it was great to see the highlights of Seoul. Unsurprisingly, my travel plans revolved around eating Korean food, exploring markets, and finding cute Korean stationery stores. Since there are so many things to do in Seoul, you should consider a biking tour or a hop on, hop off bus during your vacation. 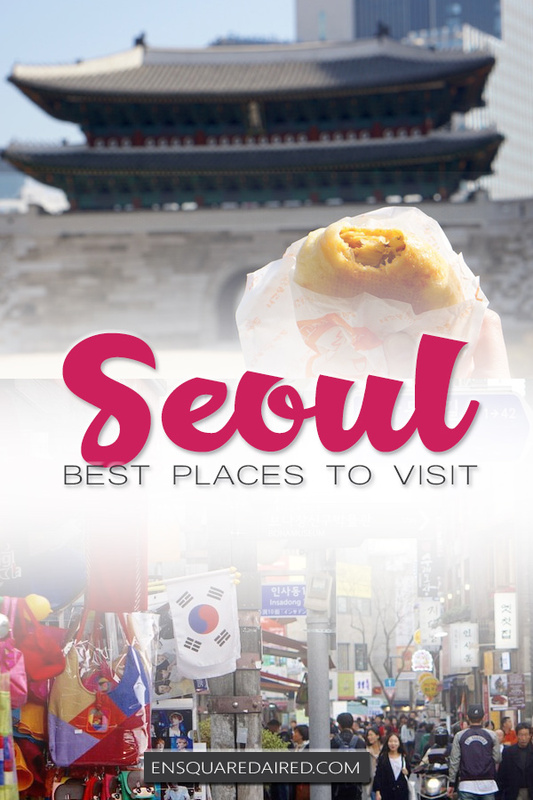 If you are planning on visiting Seoul and you are looking for ideas on places to visit, read on for 10 places you’ll want to check out during your vacation. Namdaemun market. Look in the distance, do you see the crowds of people? 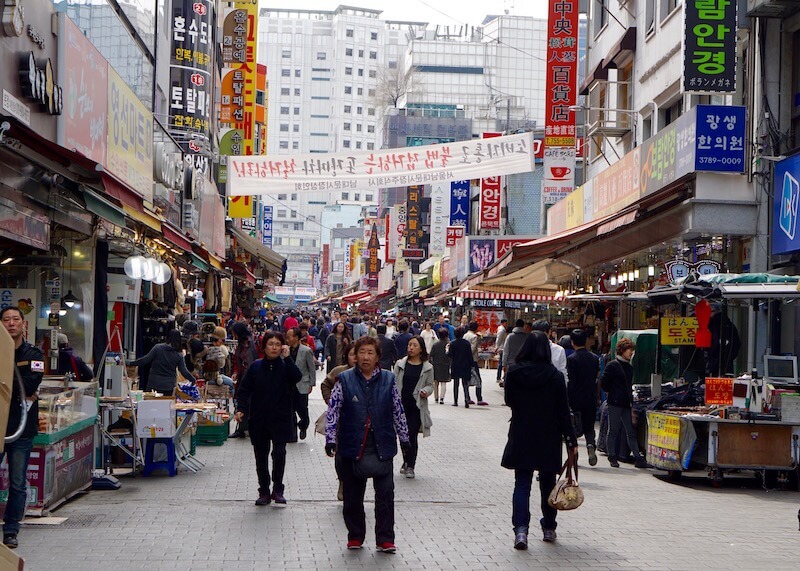 Namdaemun market is so large that it needs its own post, and rightly so. 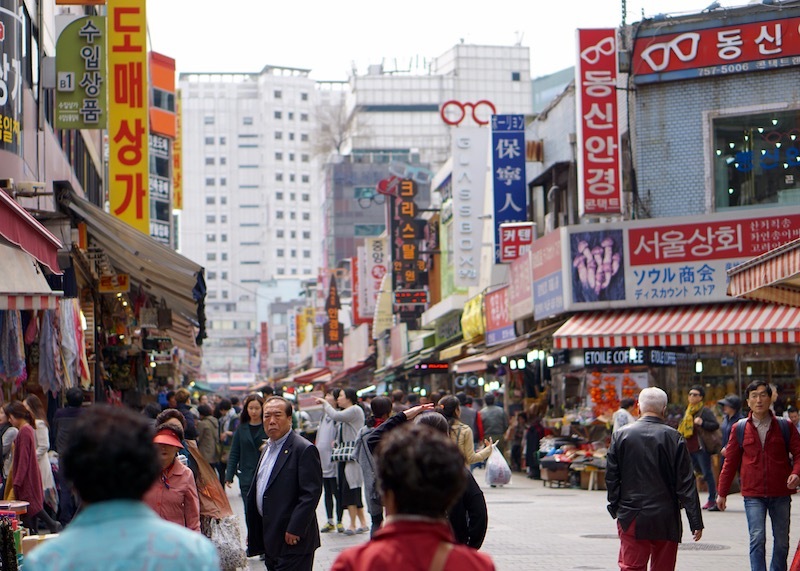 As the biggest and oldest market in Korea, Namdaemun has over 10,000 vendors and tons of street food. From electronics to jewelry and household goods, there are tons of unique items for sale. The best way to visit this market is to accept that you will get lost, wander aimlessly, and let the maze of stalls guide you. However, if you are looking for something specific, there are English-speaking guides on the major intersections in the market. They will give you a map of the market that lists all the vendor names and locations. 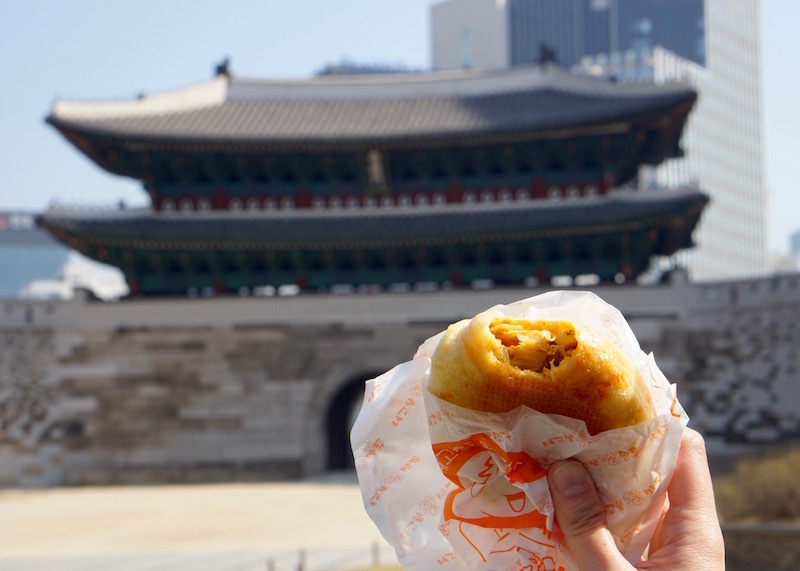 Go on an empty stomach; there is delicious Korean street food everywhere in this market. Myeongdong is one of Seoul’s most popular shopping districts and features Korean cosmetics, fashion, and many restaurants. 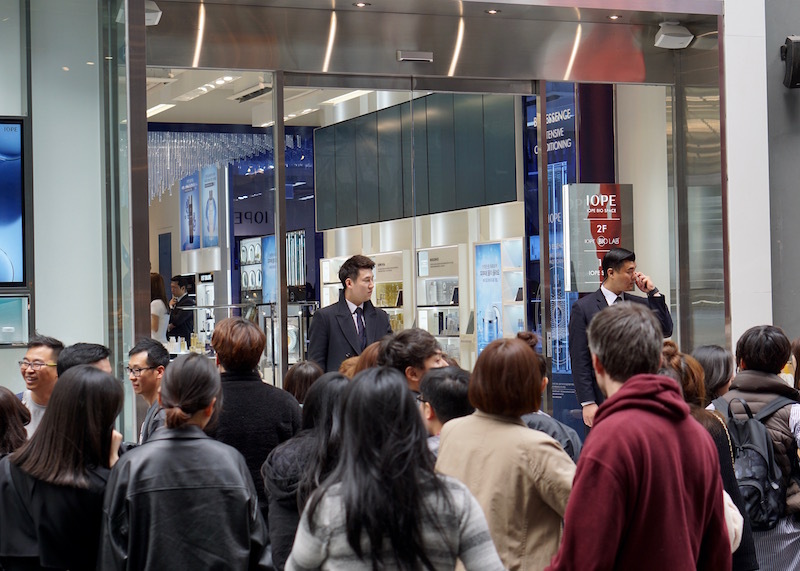 Many of the shops are mid-to-high end retail stores, with a good mix of international brands. If you are into cosmetics, this place is for you because there are tons of famous Korean cosmetic brands. You are ambitious if you try to find a time when this area is less crowded; it ain’t gonna happen! 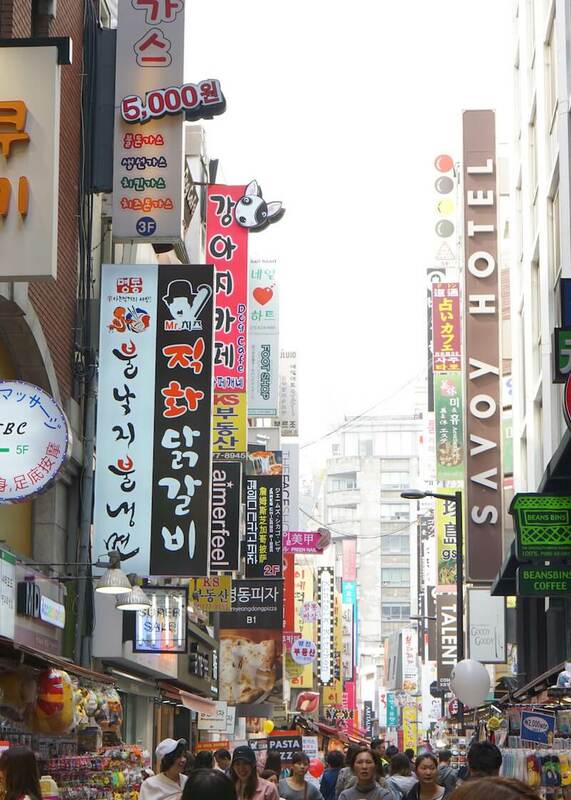 Myeongdong has a daily floating population of over one million in an area that’s less than one square kilometre. Craziness, right? Of course, you will find tons of food vendors in Myeongdong. There’s also a Line Friends shop. 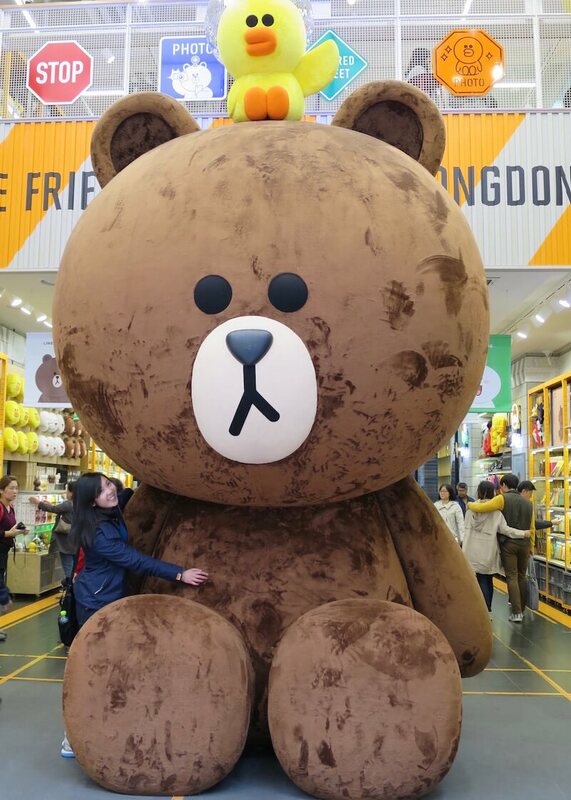 Don’t forget to stop by Line Friends and take a photo with Brown, the giant bear! Brown is so popular that there are marked cue lines for people waiting to take pictures with the bear. Oh Brown, you’re so cute! I inched my way forward and took a photo of the celebrity. I later showed it to my friend who thinks that the celebrity is Song Hye-Kyo. 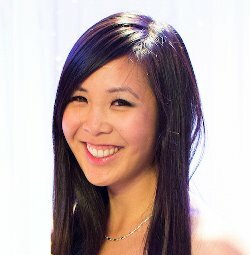 If you’re into K-pop and K-drama, you’ll want to check out these unique experiences in Seoul. Is that Song Hye-Kyo on the lower left side of the photo? You can also dress up and get a photoshoot wearing a Hanbok at an affordable price in Myeongdong! 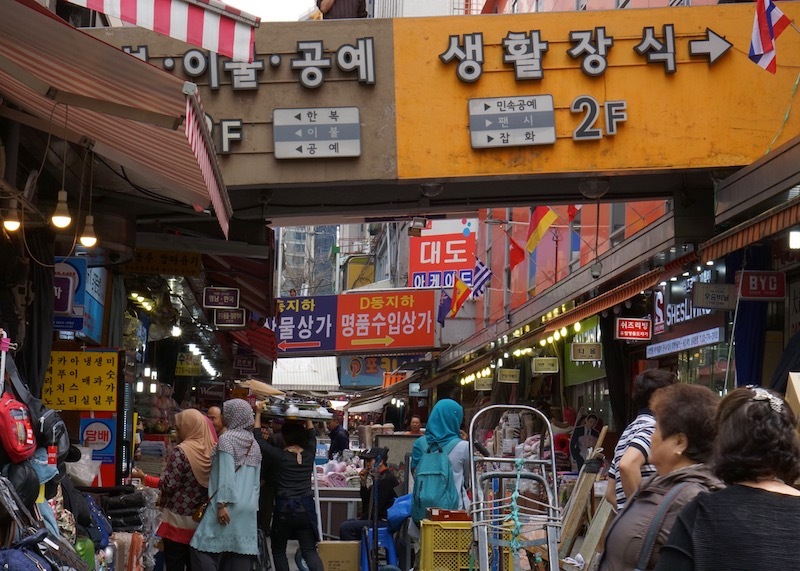 Tip: Namdaemun market is about a ten-minute walk away from Myeongdong. You can take the metro to get to either market, but I recommend walking. It’s beautiful and scenic. 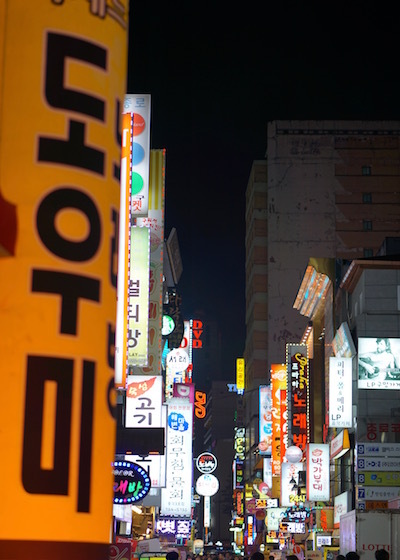 After spending a few hours in Myeongdong, I headed over to Garosu-gil, which is in the Sinsadong region. 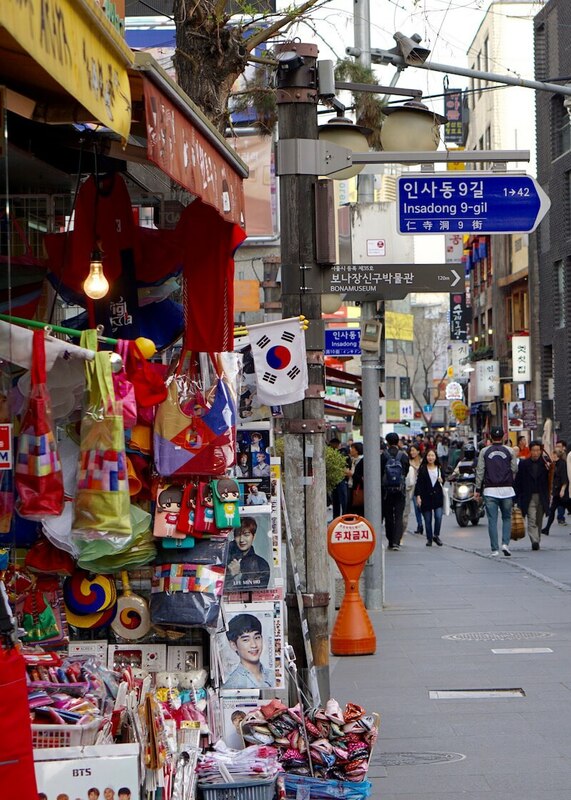 Garosu-gil is the number one spot for fashion, with alleyways leading to attractive businesses. This district has upscale designer boutiques, hair salons, cafes and restaurants and quite frankly, everyone in this area is beautiful. The women are so beautiful, and they all look like they are coming from a modelling shoot. Insadong is a great neighbourhood with an artsy, historical feel, thanks to the architecture, galleries, cafes, and teashops. You will find many alleyways branching off from the main street, with different vendors creating gorgeous stationery, like customized stamps. Bukchon Hanok Village has a real historical feel thanks to the well-preserved hanok or traditional Korean house. This village was home to the aristocratic classes during the Joseon Dynasty and has impressive architecture. 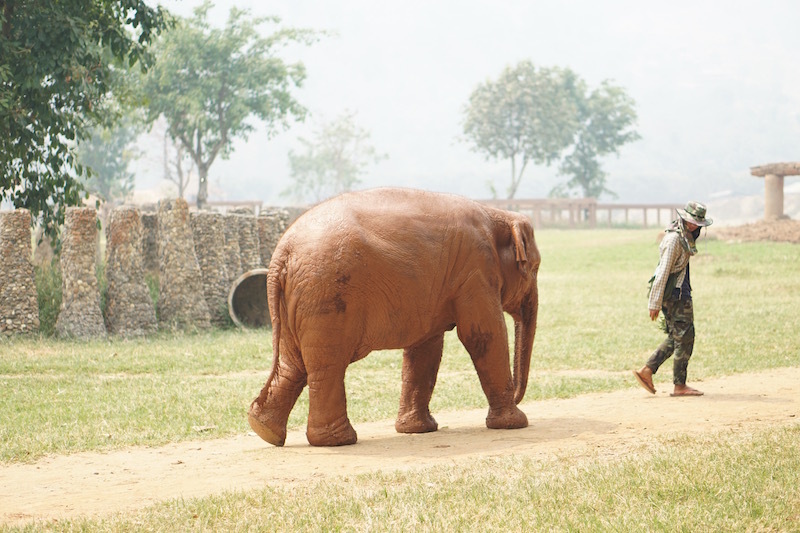 While some hanoks now have residents living in them, most run as cultural centers, restaurants, and teahouses. Prepare to get a good workout since there are many steep hills to climb. Unfortunately, I have no photos of Bukchon Hanok Village; you will have to rely on good ‘ol Google for visuals. 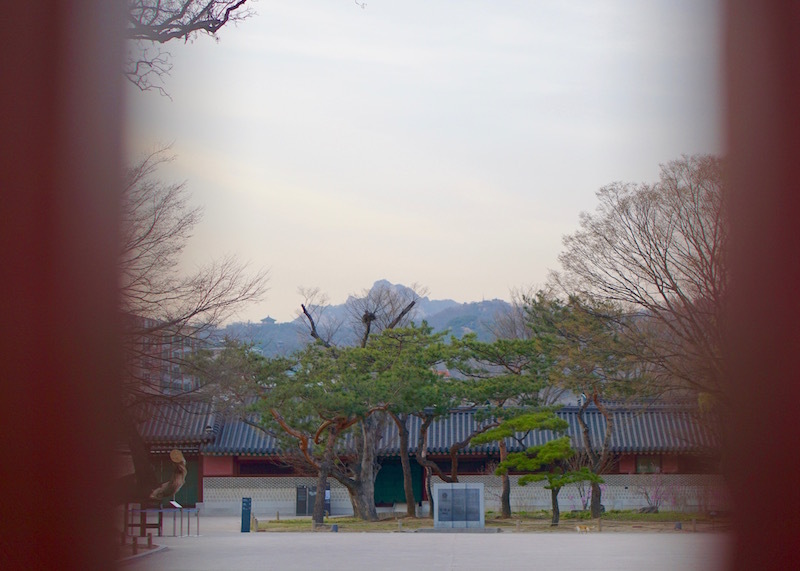 Changdeokgung is one of four beautiful palaces in Seoul and is a UNESCO World Heritage site. Changdeokgung was built as a secondary home in 1405 but became a primary royal residence when Seoul’s original palace was destroyed in the 1950s. Tip: Remember to buy tickets to the Palace two hours before closing time; otherwise, they will not let you in. That is what happened to me; I arrived an hour before closing but was not granted admission. Better yet, go with a guide so that you can learn the rich history about this palace. 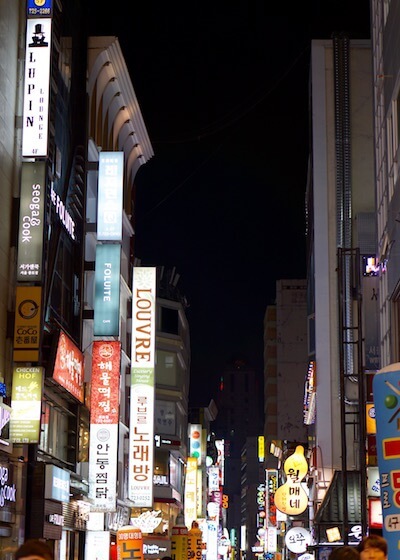 Avenue of Youth resembles a mini Myeongdong with shopping stores and Korean cosmetic shops. However, this street has tons of restaurants, all looking better than the previous one I passed by. Avenue of Youth was not on my itinerary; I stumbled upon it while looking for a Kyobo store. Since I did not have time for a sit-down meal, I did some food window-shopping and tearfully made my way to the next destination. 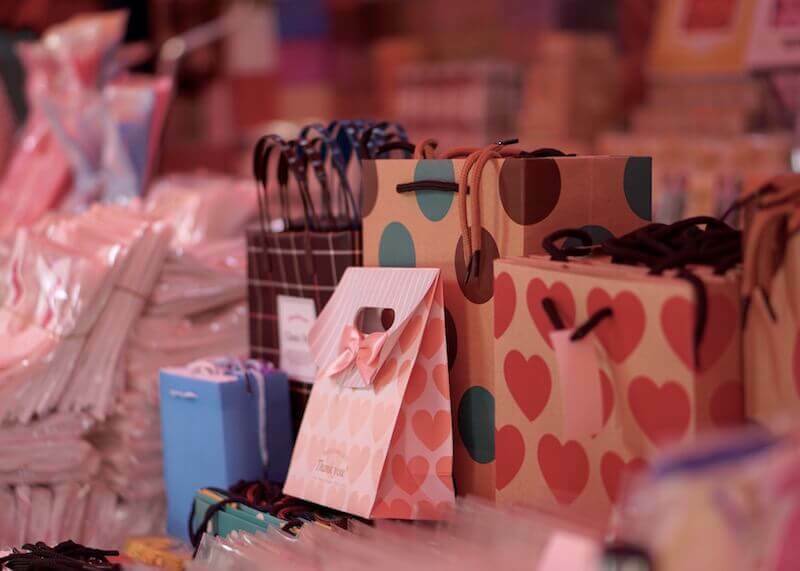 If you love shopping, Dongdaemun is the place for you since malls open at 10 am and stay open until 5 am! 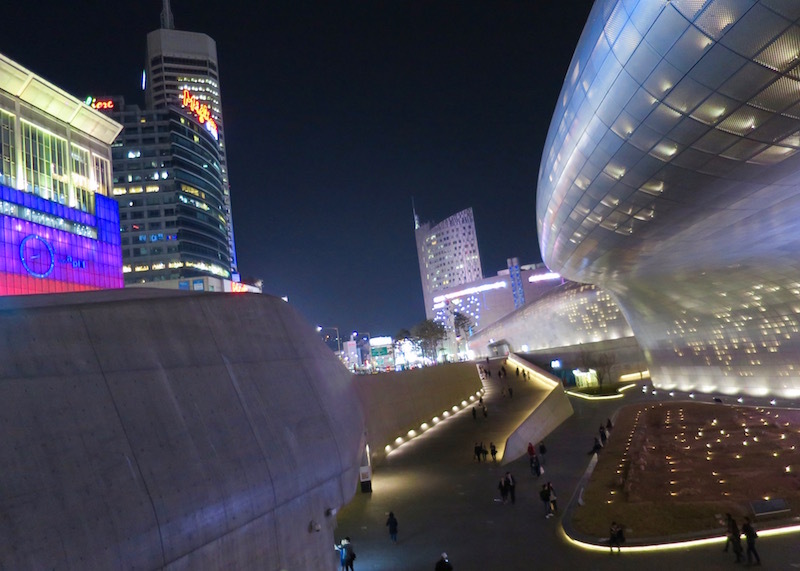 Dongdaemun is Korea’s largest shopping district with 26 shopping malls and over 30,000 specialty shops. There are two main sections in this area: the retail shopping area and the wholesale shopping area. All kinds of products are available, from silks, fabrics, clothes, to electronics, leather goods, sporting goods, and pet products. Frankly, I was pooped by the time I arrived at Dongdaemun and people watched while sipping on my Nutella shake. Before I knew it, it was time to head back to the hotel to grab my stuff and head to the airport. Luckily, I buffered some time, which helped offset the time I lost from almost taking the wrong train. 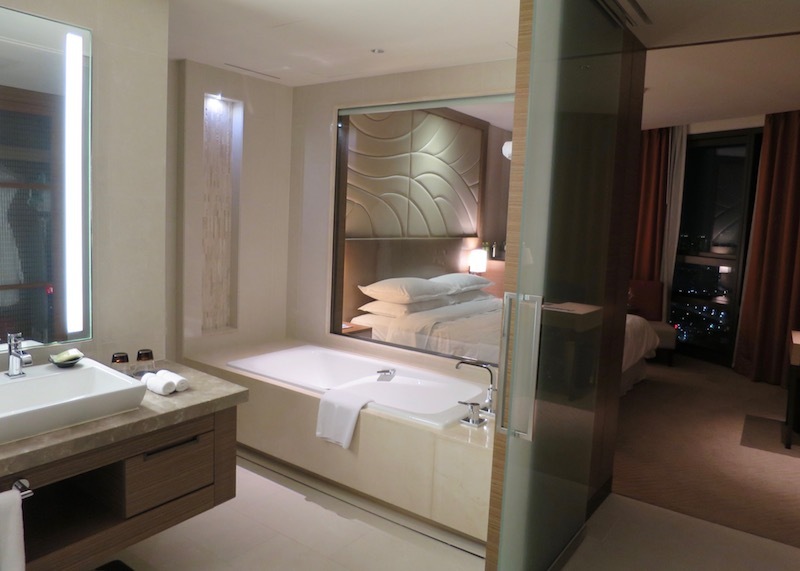 So that’s Seoul in two days for you! The two days went by so fast, even though I was out for 10+ hours on my first day. I was able to hit a few markets thanks to the preplanning work that was done for this trip. 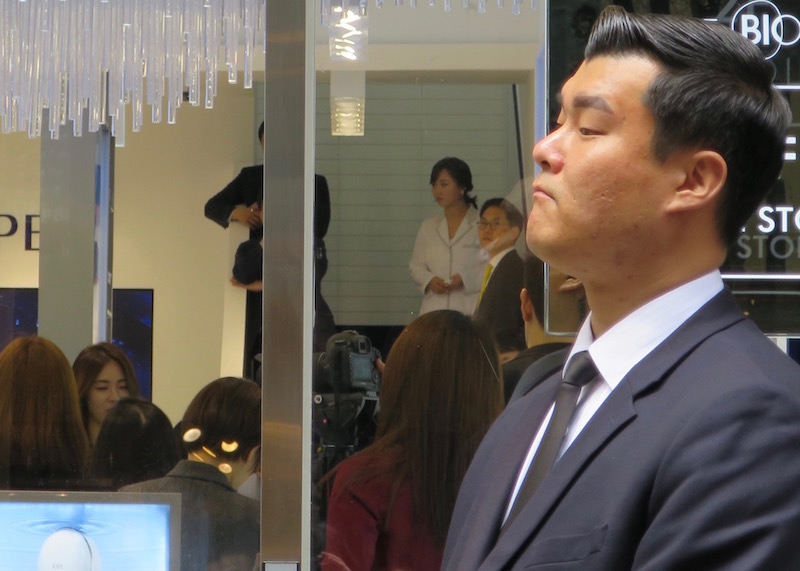 Of course, there are a ton of other things you can do in Seoul that I did not include in this blog post – there’s only so much you can see and do in two days! If you’re planning a longer trip to Seoul, check out this post for more ideas on what you can do in Seoul. AH thank you so much for letting me know!